You’ve probably been to a wine or coffee tasting, and the subtleties in quality, terroir, flavor, and more probably blew your mind. Shouldn’t a steak tasting do the same? Yes, steak tastings are a thing, and if you’ve never been to one or hosted one, now’s the time to cook up some Wagyu beef and invite over the friends and family with whom you don’t mind sharing the meats. We’ve got some tips for making sure you’ve got the right setup and prep in place for delivering an educational and delicious experience. Before you spend time nailing down a venue, keep the number of guests for your tasting to around 10—with a max of 20. The best tastings are small, so consider a dinner-party-sized steak tasting so the event feels intimate. We recommend having the tasting at your home or in your backyard if the weather cooperates. Don’t have the space? Take a look at your guest list and see who has the biggest kitchen and dining room! We guarantee that your brother-in-law or deskmate from the coworking space won’t refuse hosting the steak soiree, especially if you’re the one doing all the prep and cooking. People eat with their eyes, and this goes beyond what’s on the plate to the plate itself. For props and presentation, think rustic and serve up samples on butcher blocks with chalkboard markers with details about each steak. If you’re grilling the meat, consider a cookout style theme and serve on sustainable bamboo plates (something like this?). Once you’ve nailed down your guest list and venue, it’s time to focus on the food because that’s what it’s all about, right? You know you’re going to be serving steaks, but it’s important to round out the event with some sides and drinks that sync with steak—things that are green, savory, and starchy. Green: To balance the richness of steak, go green with a mini wedge salad, buttery green beans, sauteed spinach, or shaved brussels sprouts. Savory: Prepare a few sides that are mashed, sauteed, or braised, such as mushrooms, mashed cauliflower, or braised shallots. Starchy: Steak and potatoes are a classic combo for good reason, but level up with starchy root vegetables like carrots or rutabagas. If you go for potatoes—gratin, baked, roasted, and mashed—think simple but luxe if you’re cooking Wagyu beef. Although you shouldn’t get too hung up on picking out the right drinks for your tasting, red wine is always an excellent option for beef, but if you’ve got guests who don’t dig vino, make sure you’ve got whiskey or scotch on hand. Whiskey’s rich caramel notes work well with flavorful Wagyu steaks, and scotch’s smoky notes pair perfectly with grilled meat. For the designated drivers in the group, make sure you serve cranberry juice and carbonated water. Cranberry juice works like red wine in that the tannins cleanse the palate, especially when you’re sampling heavy meat. Carbonated water is great because it cleanses the palate by cutting through fat. Just remember: Your guests are there to savor the steak and learn more about the subtleties that go into high-quality cuts of steak, so don’t spend too much time stuck on the extras. Now that the guest list, venue, and sides are set, it’s time to focus on what really matters: the meat! Keep your cut and cook consistent, but vary where each steak comes from. Region: Terroir—climate, soil, geology, and more—impacts how cows grow, what they eat, and how they live. Just like with grapes for wine, terroir affects taste and quality. Breed: Just as a chardonnay tastes different than a pinot noir, so, too, does a Holstein or Black Angus taste completely different than a Wagyu—because breed matters! Rancher: You know how much a coffee roaster or winemaker can define the taste of a craft coffee or luxury wine, and it goes the same with steak. A small rancher with experience, expertise, and passion will always raise better cattle for better-tasting steak. Aging: The taste and quality of a steak can vary based on the year, dry or wet aging, and more. Health benefits: Different steaks deliver different health benefits. 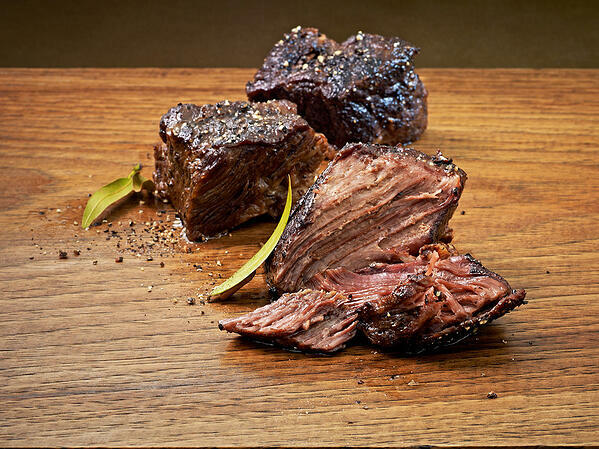 For example, high-quality Wagyu beef delivers the omega-3 and omega-6 essential fatty acids our bodies need. Next up, talk about the sides and drinks you’ve prepped and how they work best with the steaks you’re serving. You can put all of these on a quick-reference tasting card, too. This way, your guests can keep tabs on the experience so they can easily order their steak of choice after the event. Lastly, invite your guests to taste the steaks and share the experience with the rest of the group. Compare notes to see which steaks everyone can’t live without and tell everyone where you got the goods and how they can serve the same steaks and sides at home. And don’t forget about the leftovers—those are all yours.